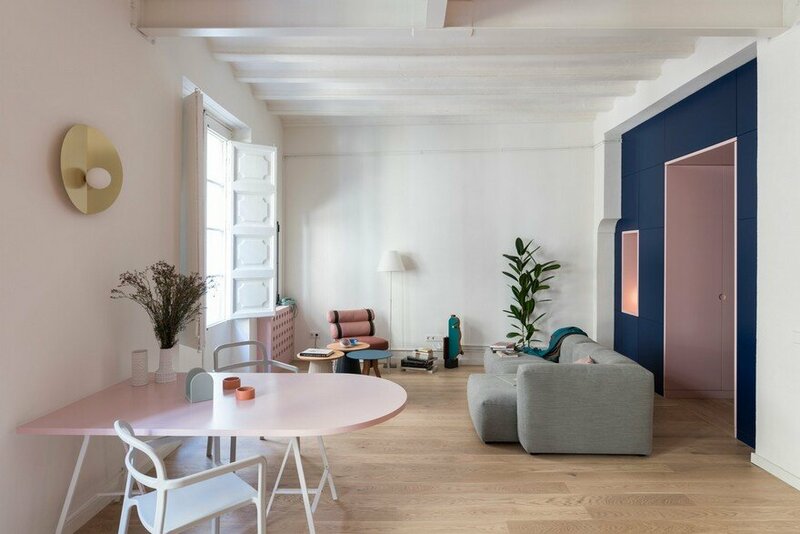 Description by architect: This apartment is located in the oldest part of Barcelona, in an ancient building that dates back to the 13th century, in the neighborhood known as Born. 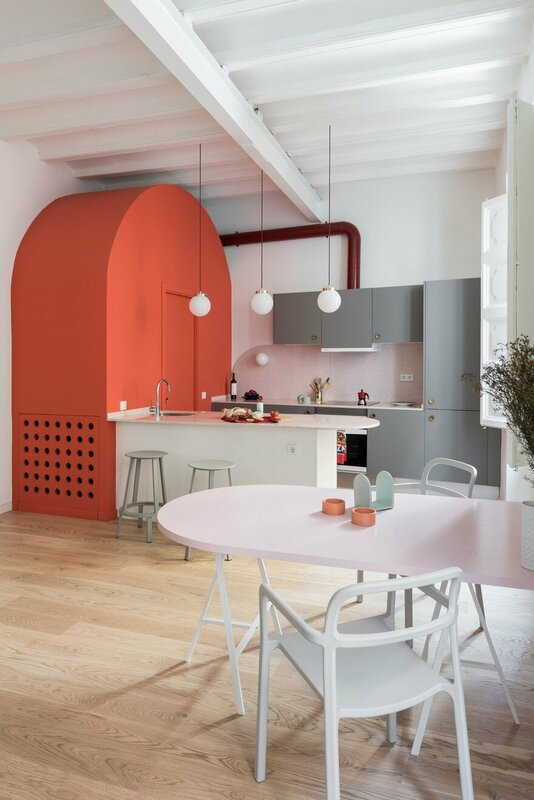 The brief was to completely transform the old property into a new vibrant flat, home of a young Italian woman, a fashion professional. 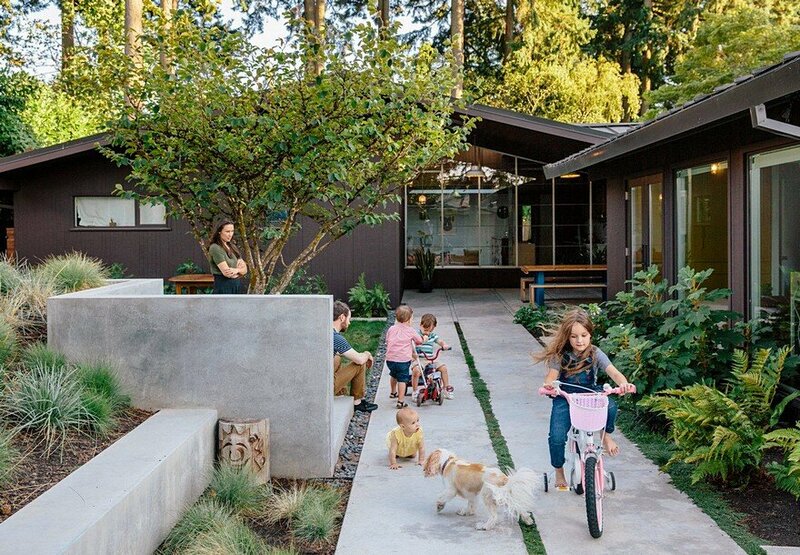 The highly compartmented layout originally included three bedrooms, two occupying the street side and a third one in the entrance space and was placing living and kitchen in the dark interior of the plot. The new arrangement overturns completely the original layout. 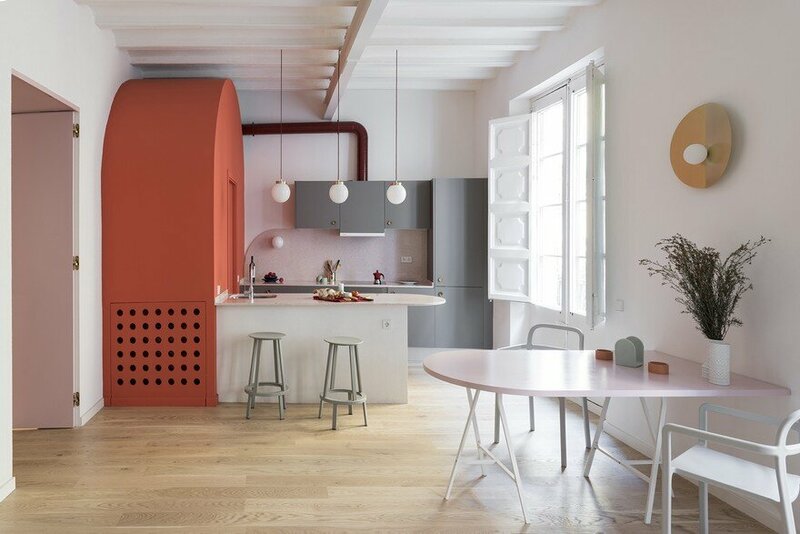 The scheme is thought to fully bring back and enhance the great proportions of the ancient spaces, with 4m high-vaulted ceilings, huge windows and thick walls. All of previous partitions have been demolished, leaving only one thick structural wall, around the new bedroom. 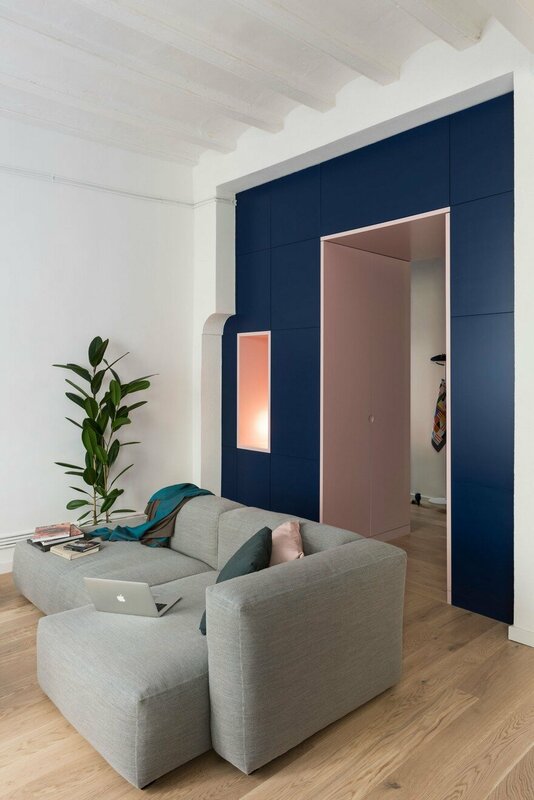 The key piece of the project and the only added partition is a thick, bespoke storage unit that divides the entrance from the living area, converting the hall into a disguised walk-in-wardrobe. 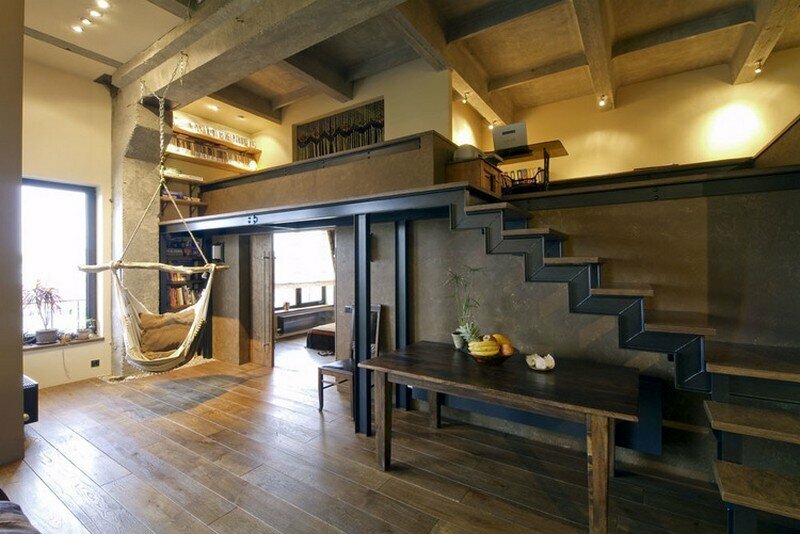 This made-to-measure, built-in storage is thought to highlight the monumental proportions of the recovered spaces. 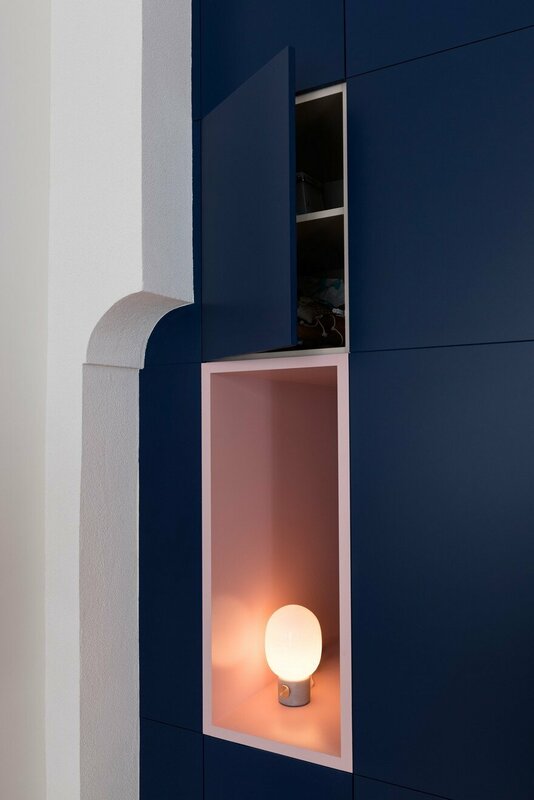 The deep blue, boiserie-like, floor to ceiling cabinetry was designed to meet the client’s request to provide storage for clothing, accessories and sports equipment, as well as other home items. 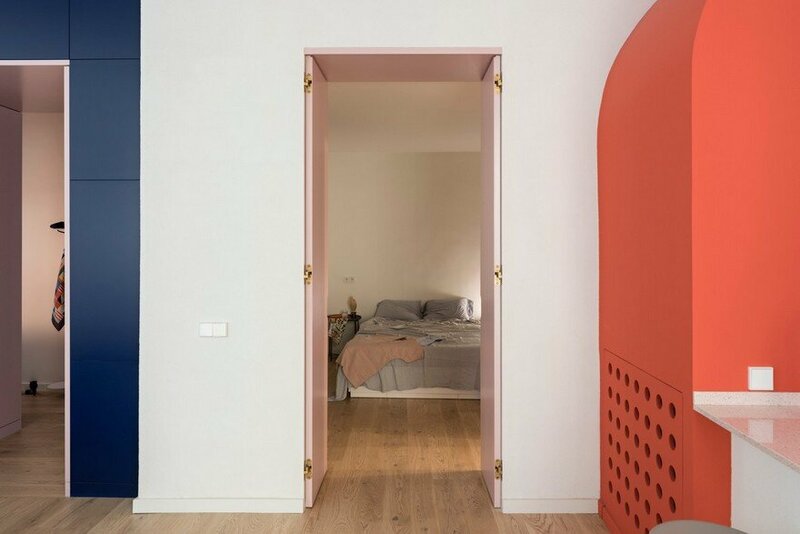 Its lacquered panels’ rhythm conceals a direct access to the bedroom from the main entrance through a double door, like a secret entry that keeps the room private and independent. 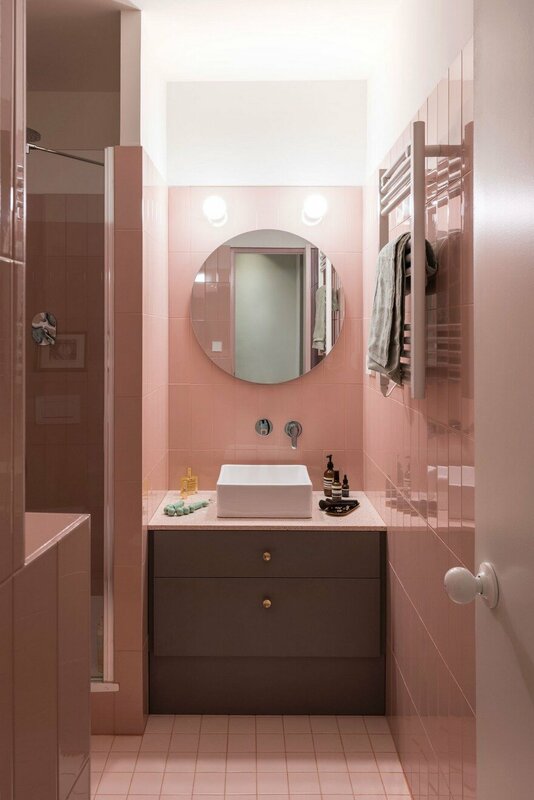 A cut out, light pink, grand doorway of over 2.5m of height connects the living area to the entrance while hiding closet doors on both sides. 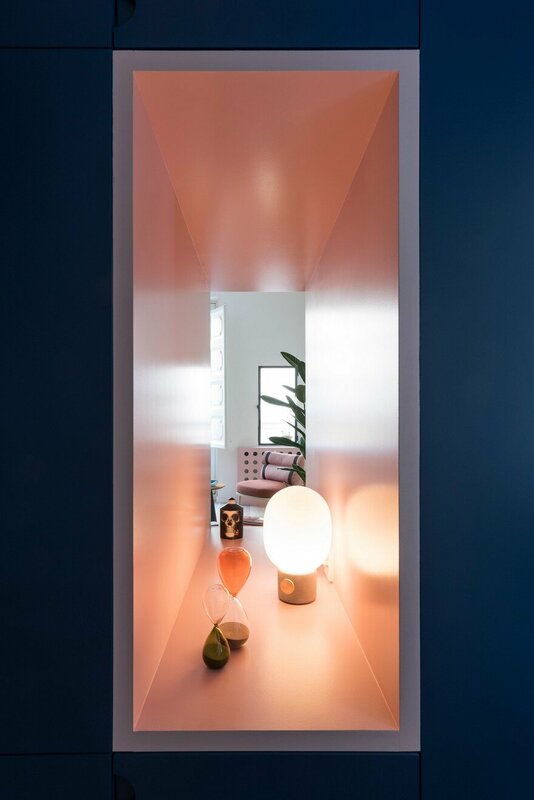 In the entryway, light is provided by a minimalistic glass globe, built-in within the unit, and through another 120cm deep niche that peeks into the living room. This opening matches the opposite living room window that was previously boarded up, now re-opened above the dotted bespoke radiator cover. The airy living and kitchen space benefits of the light of two huge balcony windows, whose original woodwork has been restored, preserving the detailed wooden shutters motifs. 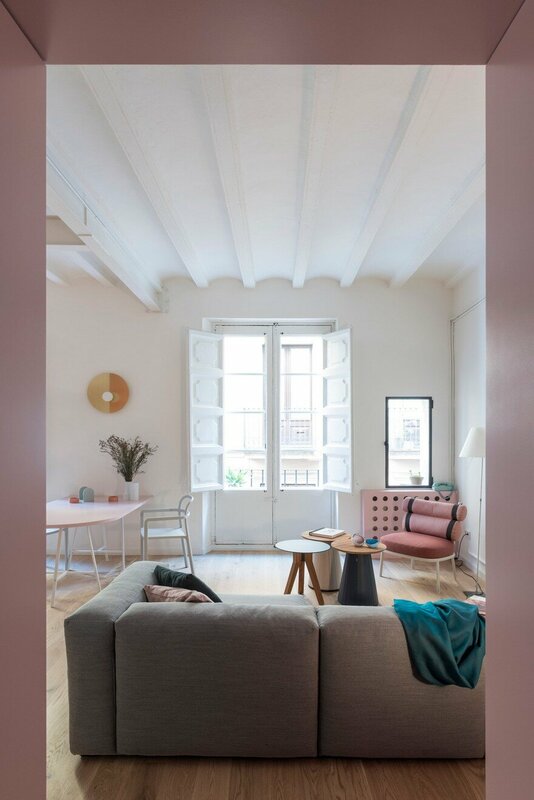 False ceilings were removed to expose the Catalan vaults and wooden beamed ceilings, all painted in white to increase brightness. 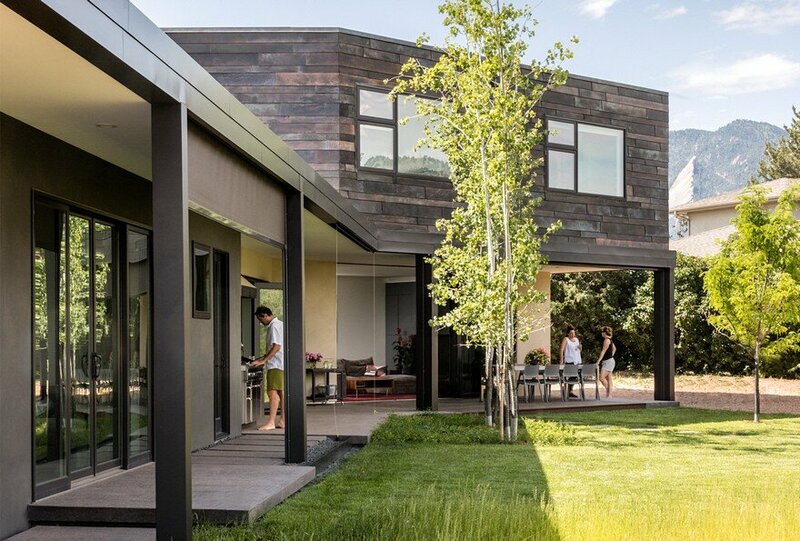 The 40cm thick bearing wall that now divides living from bedroom and entrance has been covered with a tactile rough treatment, to enhance its thick presence. As part of this wall, right over the niche, a curl structure detail emerged during constructions and has been incorporated within the boiserie panels. 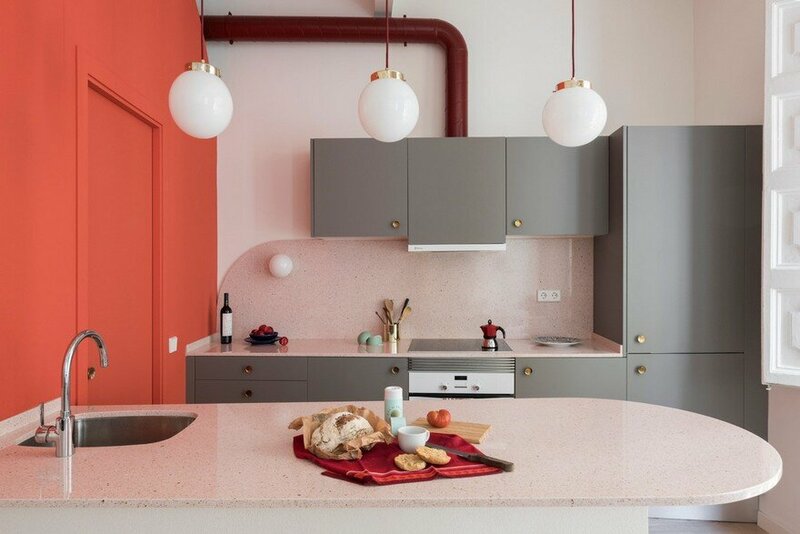 The open kitchen features a rounded peninsula hosting sink and dishwasher, that doubles as an informal eating area overhung by three globe pendants with brass details and burgundy cords that chromatically match the hood tube. The kitchen cabinets are finished in a warm grey and fitted with vintage brass concave handles. 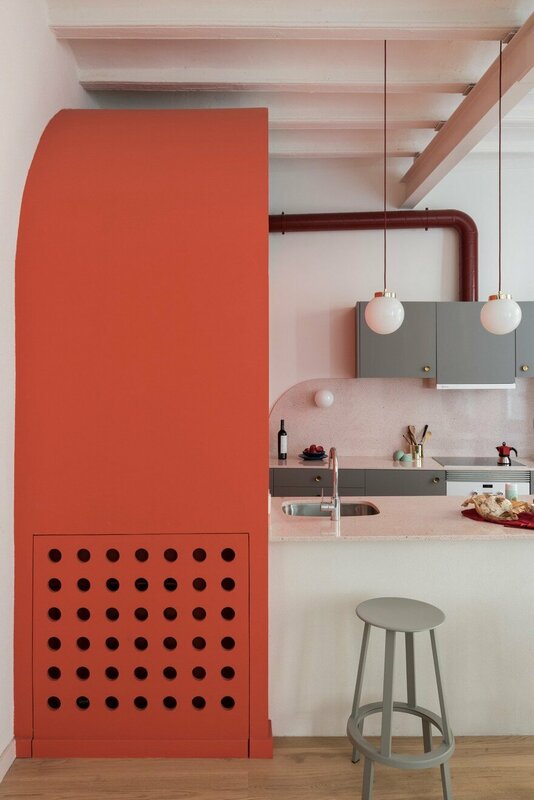 Both sides of the kitchen lean against a main feature: an arc-shaped, coral-coloured volume that hides a powder room. Client’s requirement was to have a guest bathroom, independent from the master bedroom. 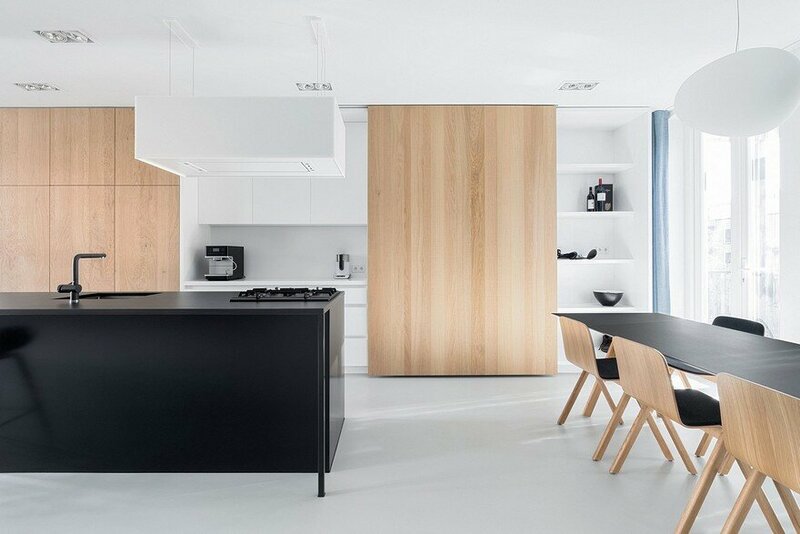 The Architects opted to turn the customer’s request into a standalone highlight of the apartment: “A full-height volume would have reduced the feeling of space in the big living room, while using a half-height volume would have transformed its top in a dusty, dark corner. 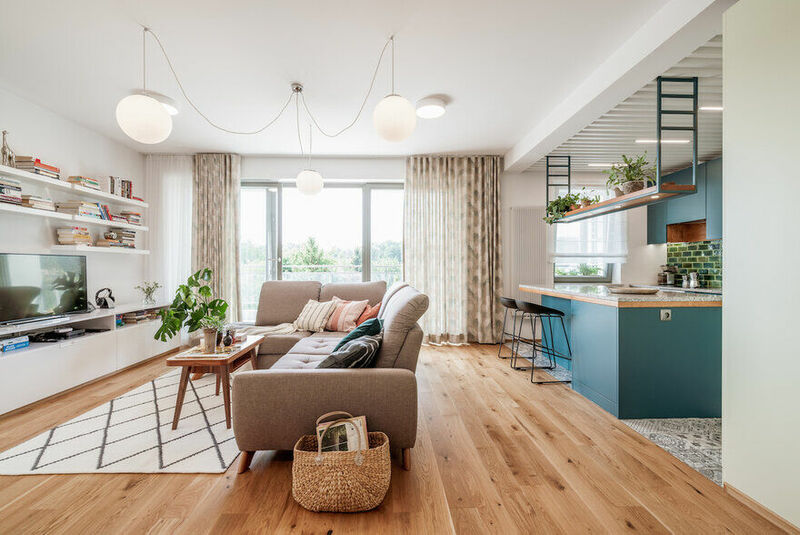 So we opted for an arc shape, that while almost touching the wooden beamed ceilings, it enhances and preserves the full room height”, the designers explain. The arc motif appears again in the corner of the dashboard, sided by a wall mounted globe lamp, and in the curved edged kitchen island. 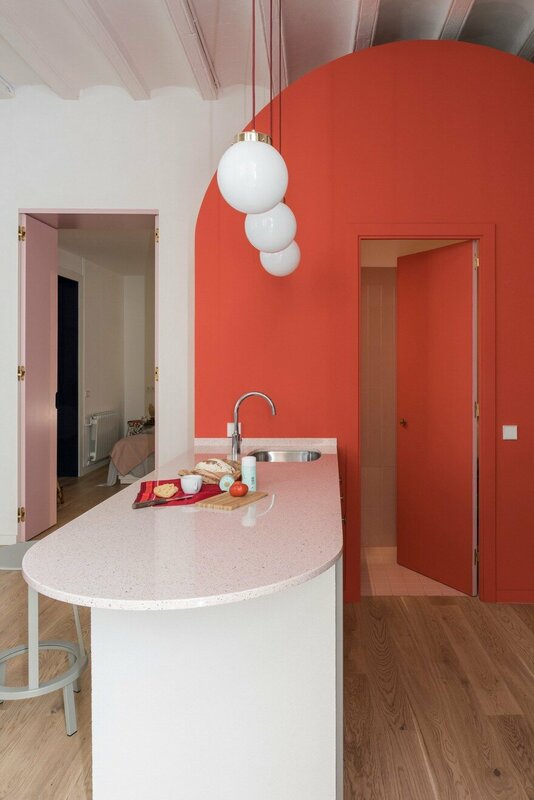 Both surfaces are made in a pink terrazzo-like quartz surface (all in Mars by Compac), as well as the kitchen counter. Between the two big windows, the golden disc of a Fold Lamp is presiding the dining area. 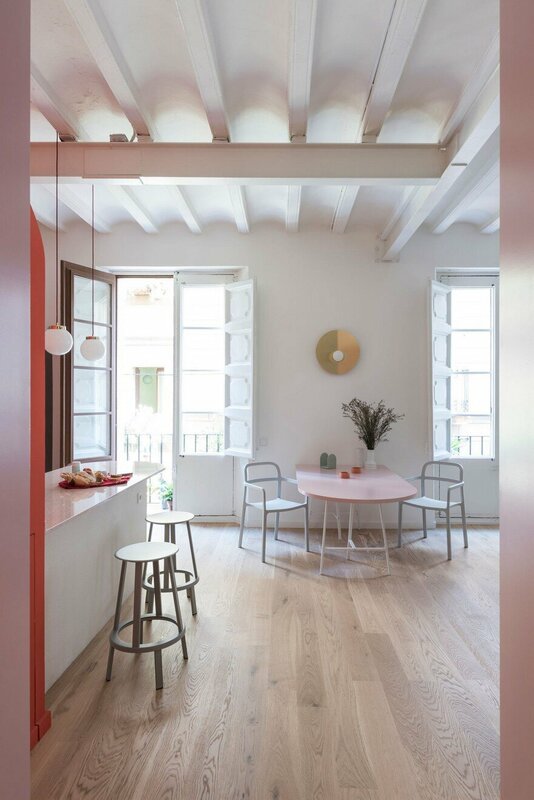 Designed by CaSA expressly for this project, the light is produced by Barcelona brand Metalware. 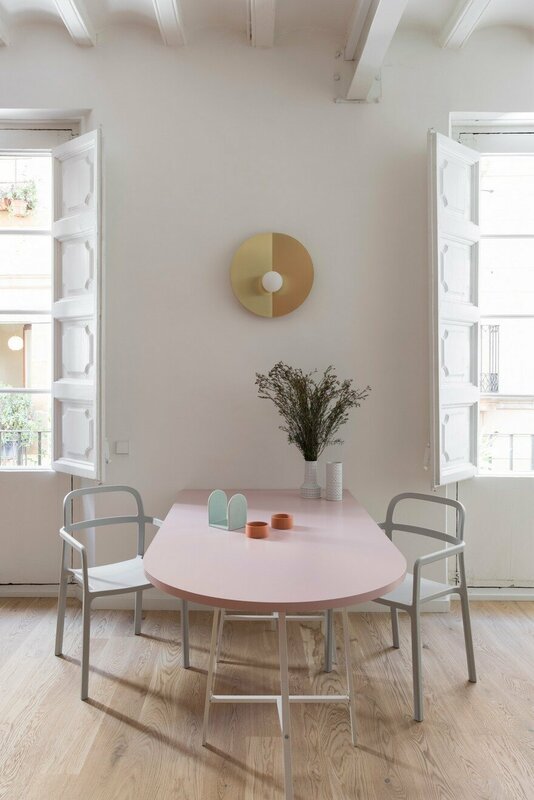 Below it, a wide table lacquered in pink, sided by Ypperlig chairs by HAY for IKEA. 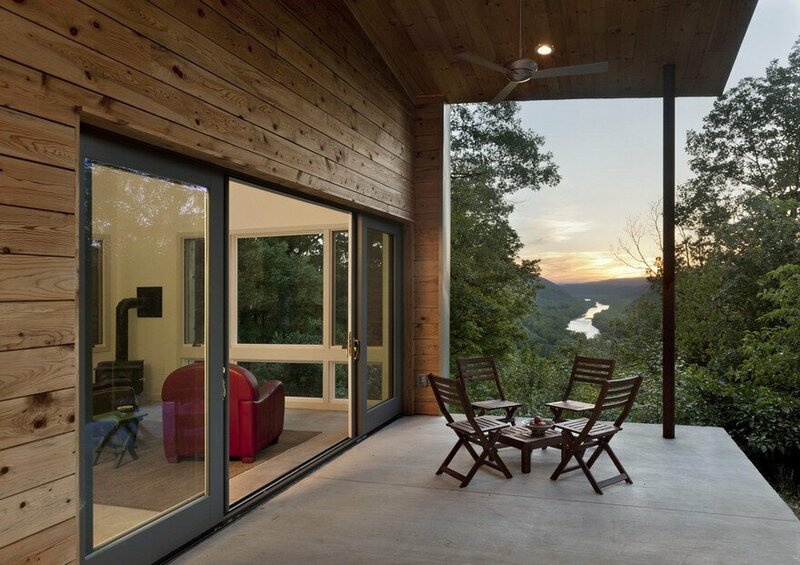 The master bedroom is accessed through a 2.5m jib double door matching in color and size the entrance passage. 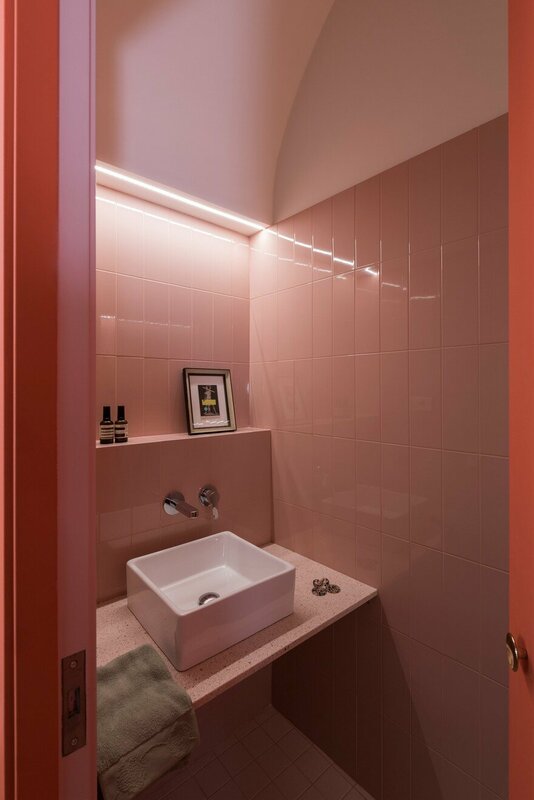 The master bathroom follows the subtle pink palette , cladded with vertical 10x30cm ceramics by Ribesalbes and 10×10 floor tiles by Vogue. All the counters are made of Mars quartz by Compac. 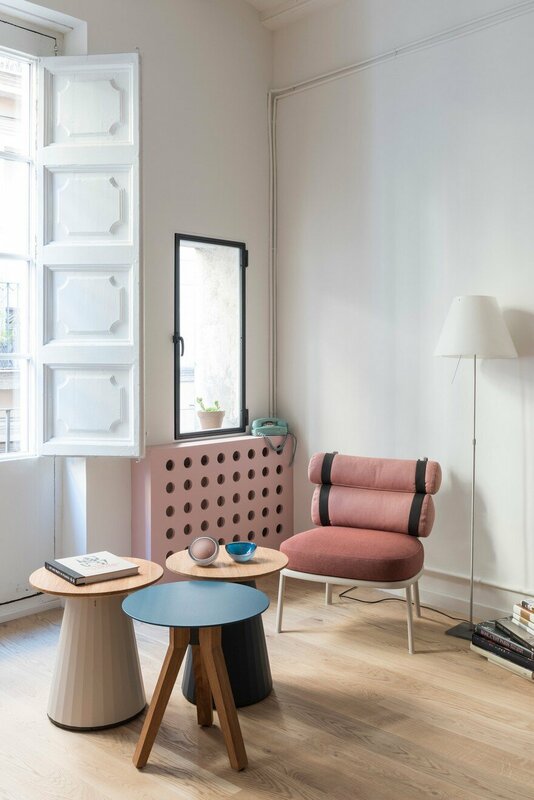 The living area is fitted with carefully chosen furniture: a Mags sofa by HAY, accompanied by a Roll Club Chair by Kettal; Of the same brand are the side tables Cala and Vieques. A classic Costanza lamp by Luceplan and a wooden sculpture by OWL complete the sitting room. In the cabinet window, a JWDA Concrete Lamp, a ceramic Fornasetti candle and two hourglasses by Hay.